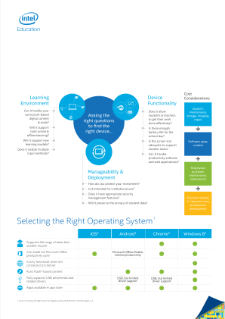 Infographic: What to consider—learning environment, functionality, cost, operating system—for choosing the right education device to provide the best support for a range of ages and activities while still being cost-effective, manageable, and secure. An empowering approach to education keeps the focus on students and equips educators with the right technology for their classrooms to enable all students with meaningful learning experiences. This guide explores technology usage scenarios by age and offers advice on which devices are best suited for teaching and learning needs. A list of questions to help guide your comprehensive evaluation of your environment, manageability and functionality needs, and cost considerations. This brief explores the benefits and risks to screen time usage and current recommendations on screen time from the American Pediatric Association (APA). See highlights from schools around the world that are redefining today’s education systems with Intel® Education.